The discussion below pertains to the first meaning. is the cutting stone. As the proverb tells us, capture the cutting stones. In this case, allowing the stone to be captured by a would let White connect her stones on the top and left. If Black pulls out , he can look forward to separate attacks on weak stones on the top and left. Compare to this diagram, where the presence of means that is not a cutting stone, and saving it has no strategic meaning and is pointless. here is a good way to save the cutting stone from capture. If , breaks the possible ladder (White at ). The result is clearly advantageous to Black. The two stones have become very weak and it would be very troublesome to save them. But they are themselves cutting stones: if Black captures them, the initial cutting stone connects to the corner. Therefore White should take better care of the upper stones, such as with here. This development is also fine for Black, though. The cutting stones are alive and continue to split White into two. 5k analysis: White should not play in a way that "is also fine for Black". 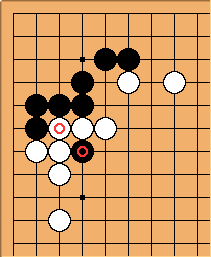 Black's corner group is invulnerable so the stones can't accomplish anything by attacking it. 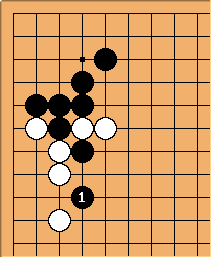 Rather than making heavy by adding still more stones which gives black a nice target to attack and thereby solidify the entire upper side, white can build a position on the left side and then try reducing the top side later. 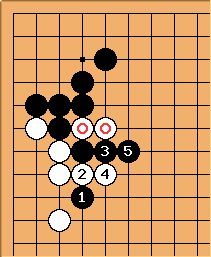 In this way, black's cut is successful, but small, since the stones weren't really doing anything important anyway. 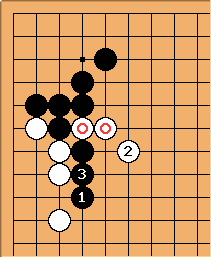 For this reason, even if it were white's turn to play in the initial diagram, saving these stones by capturing black's cutting stone is too small to play at this time.